Every year, dogs suffer and die when their guardians make the mistake of leaving them in a parked car—even if to run an errand for “just a minute”. It doesn’t have to be that warm outside for it to become dangerously hot inside a vehicle very quickly. At 72 degrees Fahrenheit outside, the temperature inside a car can heat up to 116 degrees Fahrenheit within an hour. At 80 degrees Fahrenheit outside, the temperature inside a car can soar up to 99 degrees Fahrenheit within 10 minutes. And even with windows rolled down, this has been shown to have little effect on the temperature inside a car. Hot is hot. What should you do if you see a dog in a hot car? Act fast. Remember: It only takes minutes for a dog to suffer brain damage. Time is of the essence! If you have a cell phone, take a picture of the car and license plate. It is also a good idea to take a photo of the dog/s inside the car. If no cell phone, write down the car’s color, make, and model and license plate number. If the owner doesn’t show up or the authorities are unresponsive or too slow and the dog’s life appears to be in imminent danger, find a witness (or several) who will back up your assessment and video the situation and take steps to remove the suffering animal from the vehicle, preferably into an air-conditioned vehicle and then wait for authorities to arrive. Provide water and try to get the dog cooled down. Again, if a dog is displaying any of the signs below, it is imperative to call 911 immediately, as this is a serious emergency and could turn fatal. In addition, some breeds and/or types of dog are more prone to heatstroke, such as puppies and elderly dogs, as well as those with thick, heavy coats and brachycephalic dogs (i.e., pugs, bulldogs, King Charles Cavaliers, etc.). 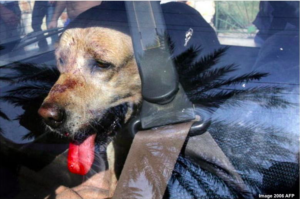 You could be the difference between life and death for a dog trapped inside a hot car. Don’t walk away and hope someone else will help the animal, because that help may not come in time.